The residents of a three bedroom house in the Buckinghamshire village of Haddenham are very pleased with their brand new kitchen, a project which has just recently been completed in spite of this winter’s wet weather. In order to provide space for a larger kitchen and utility room, part of the linked garage was put to use and converted to living space. This meant that the washing machine, drier and boiler could be moved to a dedicated utility area. 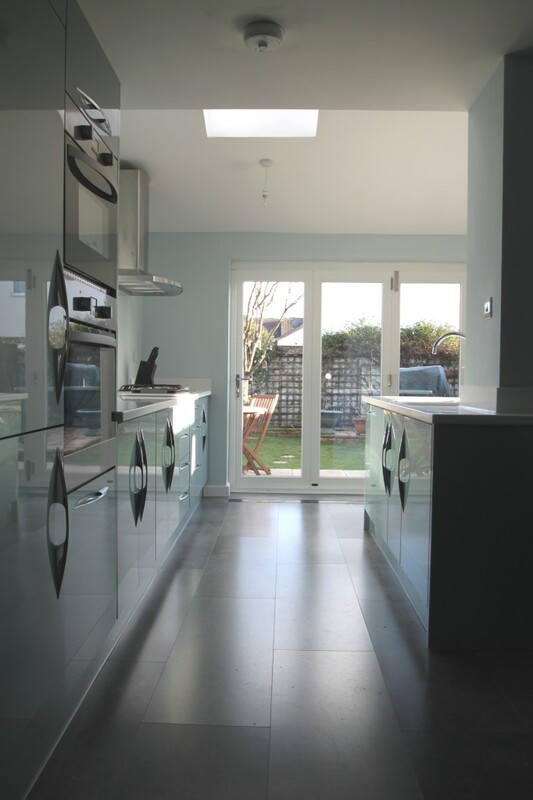 An extension across the rear of the house then allowed a larger kitchen to be created. A set of folding doors allows natural light to flood into the room and provides a clear view into the garden. When the residents contacted us, they had already secured planning permission a few years previously for a smaller extension. Our role in the project was to prepare new drawings for a full width extension, write a full specification of works and to manage the building project. We made regular visits to site during the build to ensure that the project was on track.